In a second ruling against Bombardier, the Commerce Department decided Friday that the Canadian jetmaker’s pricing of its CSeries plane in the U.S. amounted to “dumping” of goods well below cost, and imposed a further 80 percent tariff. For any U.S. airline thinking of buying a CSeries jet from Bombardier of Canada, the U.S. government just quadrupled the price. Last week the U.S. Commerce Department imposed punishing tariffs on Bombardier because its CSeries aircraft received government subsidies. In a separate ruling announced Friday it piled on some more. Commerce backed a complaint by Boeing that it was hurt by lowball pricing made possible by the government subsidies. Friday’s ruling — that Bombardier’s pricing of the CSeries jets in the U.S. amounted to “dumping” of goods well below cost — brought a tariff of 80 percent. Added to last week’s tariff of 220 percent, this means that any U.S. airline wishing to buy a CSeries plane must pay the U.S. government an amount equal to 300 percent of the price it pays Bombardier. Commerce said that because Bombardier failed to provide information it requested, it applied the tariff for the alleged dumping as estimated by Boeing. The quadrupling of the price tag effectively kills all sales of the CSeries in the U.S. Although some further procedures by the U.S. International Trade Commission (ITC) must play out before the matter is finalized in February, the one-sided nature of the two preliminary decisions suggests it will be tough to get an ITC reversal in that final stage. In that case, Bombardier can appeal the decision to higher courts, such as the U.S. Court of International Trade in New York or to an international forum like the North American Free Trade Agreement (NAFTA) or the World Trade Organization (WTO). But such appeals typically are lengthy processes. In the meantime, the tariffs will remain in place. 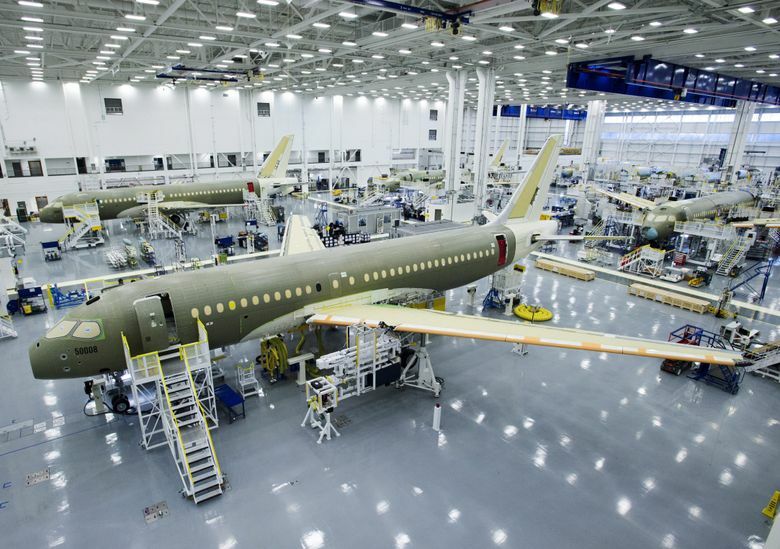 The news is a blow not only to Canada, where the CSeries is assembled, but also to the U.K., where about 1,000 people work at Bombardier’s factory in Belfast, Northern Ireland, building the plane’s wings. Both the Canadian and U.K. governments complained about last week’s decision and have threatened to withhold defense contracts from Boeing in retaliation. The CSeries is a new, small single-aisle jet family with a five-abreast passenger cabin that’s offered in two models: the CS100, seating 100 to 135 passengers, and the larger CS300, seating up to 160 passengers. The CS300 model competes with Boeing’s current model 737-700 or its new version, the 737 MAX 7, which seats up to 172 passengers. While there was no denying the claim in last week’s ruling that Bombardier had received government subsidies, the ruling this time centered on an allegation of price dumping that on its face appeared weaker — and so losing this round too is an even tougher judgment for Bombardier. Boeing cited in its complaint two U.S. jet sales campaigns, at United Airlines in 2015 and Delta Air Lines last year. Bombardier’s CSeries sales were still meager, and it was looking for validation from a large U.S. carrier to give it sales momentum. Boeing beat Bombardier for the United sale, winning an order for 40 of its 737-700 jets. But it complained that to do so, it had to steeply lower its price to match heavy discounting that Bombardier offered as it tried to win the sale. Then in April 2016, Bombardier finally made the breakthrough it had been seeking with a big sale of 75 CSeries jets to Delta. Delta was seeking a smaller airplane in the 100- to 110-seat category, a size of jet that Boeing no longer makes. So Boeing offered Delta some used E190 regional jets made by Embraer of Brazil that it needed to trade. Yet even with no contender of its own in this lost sales race, Boeing complained of the outcome. It noted that Delta has an option in its contract to convert some of that order to the larger CS300 model, which would represent a lost sale for Boeing. Delta was supposed to take delivery of its first CSeries in April. Assuming the tariffs are upheld by the ITC, that’s now extremely unlikely. Bombardier on Friday said that offering discount pricing to big customers as a program is launched is standard in the aircraft industry. U.S. aerospace experts outside Boeing have argued that a trade challenge like this in a unilateral U.S. court is a strategic mistake that will one day rebound on Boeing if other countries such as China, Russia or Brazil decide they can do the same. Bombardier has said the decision will cost American jobs since about half of the content of each CSeries jet — including its engines and major systems — come from U.S. suppliers.